Sailors on 202 yachts reveled in great breeze at the 33rd St. Maarten Heineken Regatta, held February 28 – March 3 in St. Maarten, NA. Recognized by sailors everywhere as one of the world’s best regattas, each year this event lives up to its motto: Serious Fun. World-class musical entertainment is an integral component of “The Heineken,” and this year’s prize-giving ceremony was followed by a concert on Kim Sha Beach headlined by motown legends The Commodores. The evening’s top prize – the St. Maarten Cup – for the regatta’s Most Worthy Performance Overall went to Mark Plaxton’s Melges 32 Team INTAC, winner of the highly competitive sportboat class. Plaxton’s team did not lose a race in capturing the division, comprised largely of Melges 32s and 24s. The CaribServe Cup for Most Worthy Performance on Friday went to Nico Cortlever’s X-612 Nix, who also received the Sol Cup for the fastest non-spinnaker yacht to complete Friday’s Round the Island Race. The Heineken Cup for Most Worthy Performance on Saturday was presented to Richard Wesslund, the skipper of the J/120 El Ocaso. Australian sailor Maas Hanen’s fast Outremer catamaran, Teora, took the Sint Maarten Yacht Club Cup for Sunday’s Most Worthy Performance. The Best Swan was South African James Blakemore’s well-sailed Swan 53, Music. The Panama Jack Cup for Fastest Multihull Around the Island on Friday’s opening race was won by Nil Erickson’s Formula 40 Soma. Fastest Monohull (Spinnaker classes) went to another South African yacht, Jan Rupert’s Tripp 75 Blackbird, which earned the Windward Islands Bank Cup in honor of the feat. Blackbird was also awarded the Team Goldendog Cup* for the team’s contribution to the Sint Maarten Yacht Club’s Youth Sailing program. Rodion Luka’s Jeanneau Sun Odyssey 44 Team Ukraine was the Bareboat Overall winner. Jaime Torres, captain of the Melges 32 Smile and Wave, was given the Sportsmanship Award, and the Captain Morgan Cup for the Most Rum-worthy Performance went to Dimitri Bruhns of Belgium, the skipper of the diminutive 21-footer, Liberte, the fleet’s smallest boat. 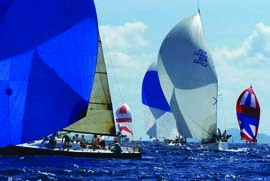 Angus Ball’s Gunboat 66 Coco de Mer won the Xerox Obersi Cup, also known as the Spirit & Style Award. Jason Carroll’s Gunboat 62 Elvis, representing Larchmont Yacht Club (and reportedly riding with The King), won the Multihull 1 division. For over three decades, the St. Maarten Heineken Regatta has showcased the top boats and sailing in the Caribbean, and become equally famous for its parties and musical entertainment. 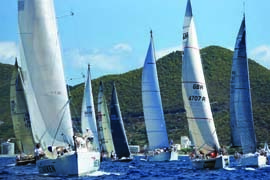 The 34th Annual St. Maarten Heineken Regatta is March 6-9, 2014…the time to start planning is now! Check heinekenregatta. com for results, photos, videos and more. *Team Goldendog, based in Milford, CT, competes annually in the St. Maarten Heineken Regatta, raising funds for organizations that support their mission of helping homeless animals find their forever homes. Visit teamgoldendog.org.